This attractive t-shirt was designed especially for Yom Yerushalayim, Jerusalem Reunification Day. 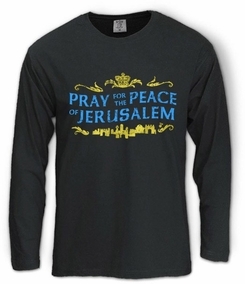 The inspiring words of Psalms "Pray for the Peace of Jerusalem" proclaim the aspirations of all that love Jerusalem. Royal crown on top signifies the sacred stature of the Holy City. 100% high quality cotton t-shirt Our t-shirts are made of 100% cotton and are long lasting with bright colors. Our products are all designed and printed in Israel.